Cranberries make the season, wouldn't you say? 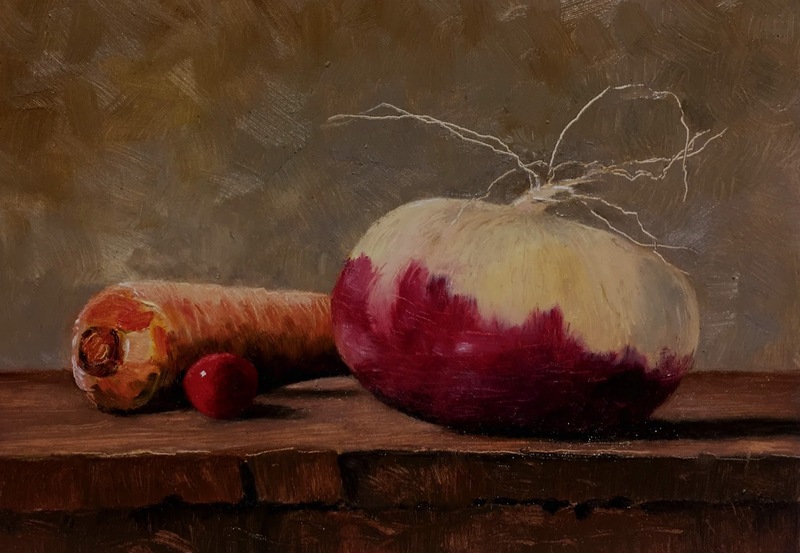 This is a small study I did for Neil DiSabato's color class at the Pennsylvania Academy of Fine Art. 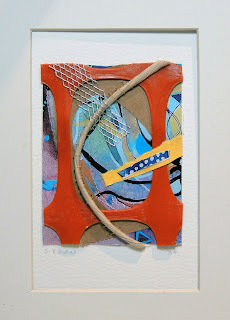 "Bricolage 31", 5 x 7"
"Bricolage 31" calls to mind my favorite childhood game, Mousetrap, or a Rube Goldberg sequence. I snipped a piece of Philadelphia Department of Streets orange fencing from construction on our street. Tela's Market across the avenue provided the elegant twisted paper bag handle. A memento of drywall mesh from our old house turns the collage into a personal story of the orderly chaos that was our move to the city. This assemblage is a Color Story created for Neil di Sabato’s color theory class at the Pennsylvania Academy of Fine Art. Color Stories are small collages made of any media or flat surface. No boundaries on what those can be. I’ve heard some undergrads have used their underwear. Oh, artists! The unifier is color and compositional harmony. As with two paintings I created some years back, “Fernando” and “Maria”, I think of my Color Stories as bricolage. Bricolage is a French term for something created from objects at hand. I came upon the term one winter when I no longer felt inspired to paint the season. I invented compositions with tropical landscapes, birds at my feeder and objects in my studio. I called these paintings bricolage instead of surrealism because the term seemed to better describe my method. During the last few years I’ve studied with several fine teachers. With Pat Martin I poured, splattered, rolled, dissolved, collaged, sewed, stamped, glued, sanded and resisted paint, asphaltum, plaster, turpentine, ink and water. With Kass Freeman, Trisha Vergis and Christina LaFuente, I’ve drawn, composed, toned and textured. With all of them, I’ve turned paintings upside down and sideways, looked at the backs of them to see if they are better than the front. Sometimes they are. Now my studio contains an extensive array of materials, particularly generated while working with Pat. During her classes I took up scouring the ground, streets and hardware store aisles to find textures and surfaces. Enter Neil’s Color Stories. Compose flat surfaces into smaller than 6 x 8” objets d’art? It just so happens I have mountains of interesting surfaces, painted, clipped and foraged, in need of loving arrangement.